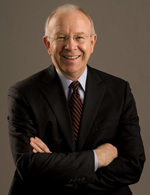 Gary C. Cornia is the Dean of the Marriott School of Management at Brigham Young University. He is the past president of the National Tax Association and has served as State Tax Commissioner in Utah. He has been a visiting Fellow at the Lincoln Institute of Land Policy and a visiting Scholar at the Andrew Young School of Policy at Georgia State University. He has published a variety of articles on state and local tax policy, decentralization, and property tax. He received his PhD from The Ohio State University.